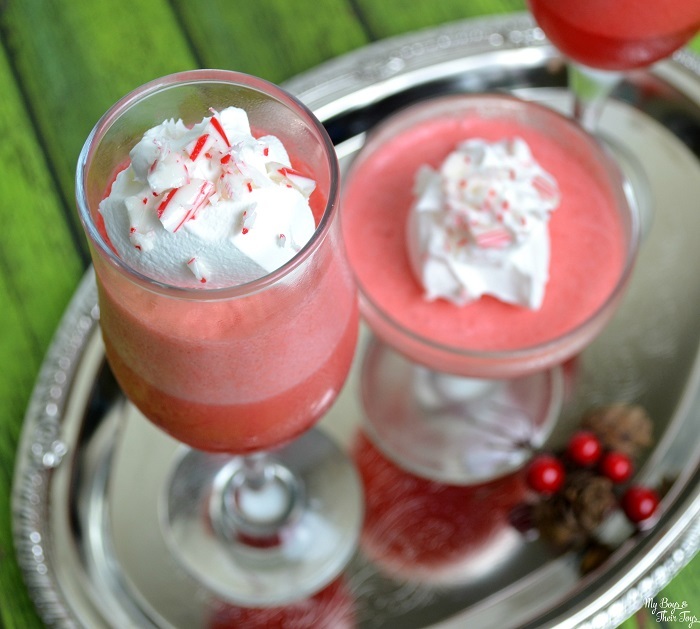 Wrap up the holidays with this easy 3 ingredient dessert: Candy Cane Dessert Minis! It makes a perfect treat for New Year’s Eve or Valentine’s Day, don’t you think? While shopping at Walmart, I picked up the 3 ingredient dessert items. Add boiling water to combined gelatin mix and 1/3 cup crushed candy cane in medium bowl; stir 2 minutes or until gelatin mix is completely dissolved and candy is melted. Reserve 1/2 cup COOL WHIP. 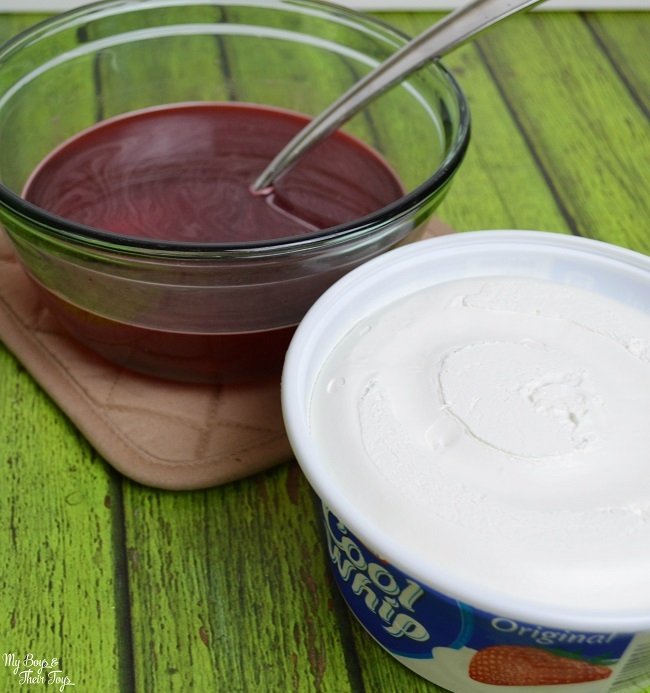 Add remaining COOL WHIP to gelatin mixture; whisk until blended. Spoon into 12 (2-oz.) shot glasses (or other dishes of your choice). Refrigerate 2 hours or until firm. Crushing the candy canes was easy and something the boys enjoyed helping with. We placed a few in a sealed plastic bag and used the back of a spatula to make them into smaller pieces. Look how beautiful they turned out! I love the layered colors in the glass, don’t you? 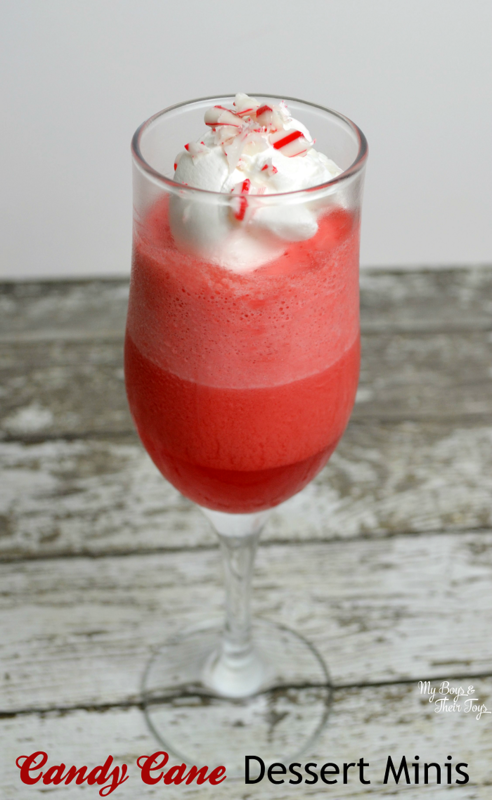 I definitely recommend using a clear glass to wow your guests with this easy dessert idea. 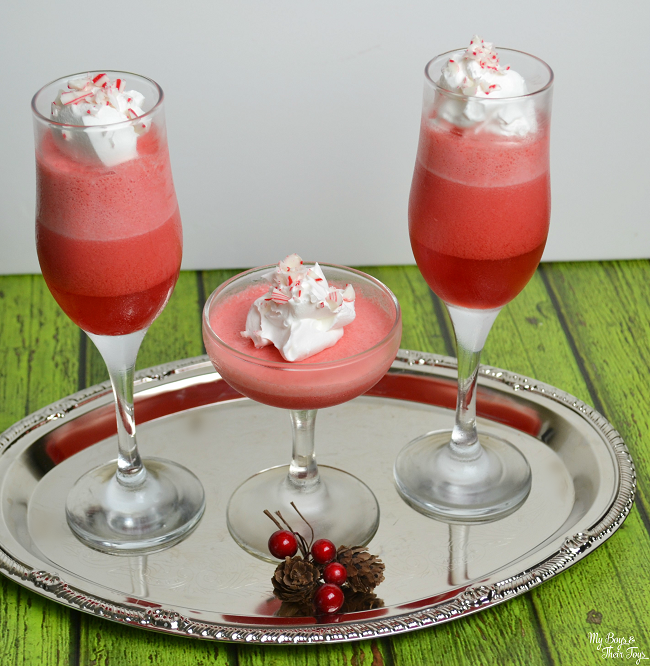 Who wouldn’t want to ring in the New Year with this amazingly delicious dessert in hand! Even the kids can participate. For other incredible recipe ideas, head over to the Kraft Hub. They have a ton of featured recipes like Buffalo Chicken Mac and The Single-Best Cheeseburger, plus other dessert ideas like Cookie Butter Cheesecake. You can find a lot of easy dinner party recipes. Oh and did I mention they have coupons too? Yep – on many of those ingredients you need for yummy recipes. So what are you waiting for?! Oh those are so cute for the holidays! I have to try these! These are so neat! I must try these and I am sure my kids would love them too! Yep – great option for the kids! these are beautiful and i am sure they taste great too! Wow! This looks delicious. I might try it with the strawberry flavor. I’d love to try this! Looks like something the whole family would like. These sound really good, I think they would be great for New Year’s Eve. This are so pretty and I bet you can add a little alcohol for New Years Eve celebrations. 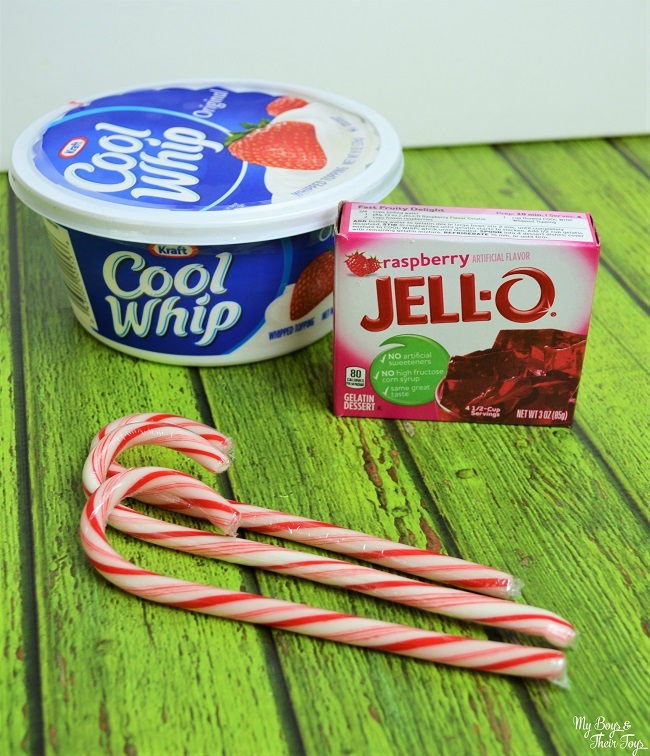 I love the idea of this candy cane dessert with jello and cool whip. I will definitely bookmark this for the next holiday. Oh wow what a great combination. Not so much ingredients but packs a big punch. I never thought about raspberry Jello with peppermint. Should be an interesting blend of flavors. These look delicious and easy to make. It also gives me something to do with some of those candy canes after Christmas! Thanks! This dessert really looks delicious and fun to make. I sure love raspberry jello and want to make this for the kids. They would love it! Those look heavenly! I have to try this next Christmas. These look delicious. Will definitely keep this in mind for Christmas.